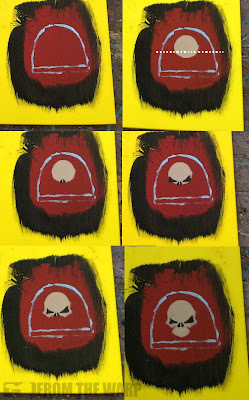 Drawing and painting skulls should not be difficult. Like most other freehand elements, if you break it down into a few simple overlapping shapes, you'll have great looking skulls in no time at all. Here's the method I use to replicate the Forge World style skulls you see on their resin bits. You could easily modify the shape of the skull here to suit your tastes. The first thing you need to do is take a good look at the area you're working in. Once it's ready to go (meaning you're at the point of adding your freehand work), you have to imagine a line across the middle of the available painting area. This is where you're going to start. You don't need to draw the line on your model, just remember it for the first part of the skull. From that, you'll build on it and your scale shouldn't change. The skull is broken down into 5 parts. The head, nose, eyes, cheekbones and jaw. We're going to start with the head and add those other parts on top of it in a particular order so that we "build" our skull and it stays symmetrical and balanced. The head is nothing more than a simple circle. It should extend slightly below that imaginary line we have across the middle of our work area. The nose is made up of two small triangles that are placed at the bottom of the circle in the middle. The eyes are two more triangles placed one on each side of the nose along the bottom of the circle as well. The cheekbones are maybe the hardest part of this whole thing since they are not an exact shape like a circle or triangle but more like protrusions out from each side of the head. They stick out at an angle from each eye. You can make them any shape you want really. And the jaw. It's an extension of the head that comes down slightly and is angled. Think of it as a square that is resting on one if its corners. Once you have the basic shapes blocked in, you can go back and do a little highlighting and shading to give the skull some texture and depth if you want. Of course you can always leave it simple and one color as though it's been stenciled onto the vehicle as a kill marking or such. Like it was straight out of a How to Draw book. That's really nice and simple Ron, thanks. I particularly like the way the slightly lopsided triangles for eyes make it look like it's sneering. Gives the image some real character. Nice work,freehand skulls and such always pose a problem.Finally got the hang of that and now I'm learning how to sculpt small skulls in green stuff,which isn't as hard as it might seem,thanks to you Ron,your tip of always drawing/planning it out prior to getting into it has saved me countless headaches (and a small fortune in wasted GS).Now I need to work out how to do angelic wings (think of the wings on the Dark Angels Chapter banner) freehand and I'm all set.Do you have any tips for this one? rob82: And you can curve the tops of the eye triangles slightly to make it look even more menacing. Altering the angles and such will give the skull a slightly different look. Oktane: Wings huh? Those are pretty easy actually once you know where to start and how to attach each wing to the previous row. Let me see what I can come up with. Very nice Ron. This would look great on a vehicle or a marine. Thanks! The whole point is start out with the lowest level, the longest feathers, let them set completely before moving on to each subsequent layer. Then do the wing bones last. It is super easy for banners, for actual wings on a model just do it in two stages as the link above shows. If you use thin enough green stuff you can do the outside, then shape the curve of the wings like Ron does to gs banners using superglue, before doing the inside layers of feathers. Looks great! The highlighting really makes it stand out. Now if only I had an army that could use some skulls... maybe next army. Da_Sub: Thanks for the links. It's worth noting that both links are for sculpting. It's interesting to see how you would go about building greenstuff wings though. Thanks Ron,everything I've tried from your articles has worked very well,so I'll be eager to read your thoughts on the subject. And to Da-Sub:Cheers,they'll both come in very handy,I've always been a little intimidated by sculpting something as complex as wings,now I'll attempt some scratch built Thunder Shields (using Hi-Tech Miniature Universal SF shields as a base,the size of these things are awesome,highly recommended) for my net Deathwing squad. I've gotta start doing more freehand. That looks great! Oktane: Glad the tutorials help. Nice to hear that folks are putting them to use. GSI: It's like sculpting, once you start doing it to your models, you find a reason to add it to every one of them. excellent! I´ve been waiting for this! Thanks Ron!!! That actually looks like a good method for sculpting a skull onto a flat surface too, I've always struggled with getting a skull that is just slightly raised from the surface to still look like a skull. Thanks! Stephen Habets: You know what, that would probably work now that I think about it. Good catch! Really great tutorial. One of these skulls now adorns my macharius. I'll be sure to link to this when I next post with photos! Colonel: Excellent! Let me know when it goes up, I'd love to see how you got on with it. 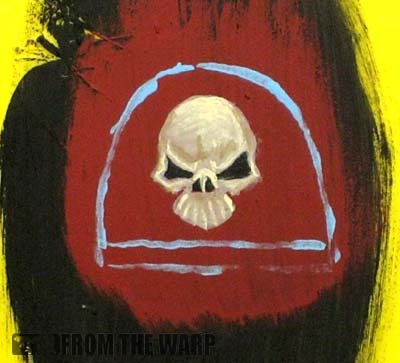 Just used this to freehand the 'crimson slaughter' icon (It's a skull with iron halo) and it worked a treat. If you fancy a look at the finished result you can see it here. Cheers for the excellent tutorial Ron.